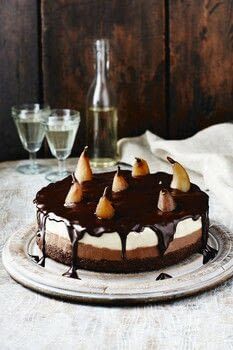 The poached pears in this autumnal cheesecake look so inviting poking up through the layers of chocolate and chestnut. The chocolate glaze is worth trying on other cakes, too. Chill the cake before pouring over the glaze to freeze-frame the chocolaty drips. gently to dissolve the sugar, stirring occasionally. 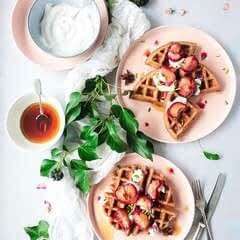 Add the pears to the saucepan and place some baking parchment onto the surface of the syrup and a lid on the pan. Simmer for 15 minutes, or until the pears are tender. Leave the pears in the syrup and set aside to cool. To make the base, line the cake tin with cling film (plastic wrap). Place the digestive biscuits in a plastic bag and crush into crumbs with a rolling pin or the back of a wooden spoon. Melt the butter in a large saucepan and stir in the crushed biscuits and cocoa powder. Press the biscuit mixture into the bottom of the prepared cake tin, making the base slightly higher at the sides. Chill for 20 minutes or until firm. chocolate until it is almost melted, then remove the pan from the heat. Remove the bowl from the saucepan to ensure that the chocolate doesn’t become overheated, and continue to stir until the chocolate is completely melted then set aside to cool. chocolate into one half, and the chestnut spread into the other half. chocolate filling and chill again for at least 2 hours or overnight. the cake tin and set on a serving plate or cake stand. Pour over the chocolate glaze and serve.